Skin discoloration and unsightly veins can be small, but bothersome, especially if you’ve worked hard to keep your skin healthy. Fortunately, we have treatment options available that can significantly reduce the appearance of these problem areas with minimal disruption to your skin. Vbeam Perfecta treatments can safely and effectively remove discolorations caused by vascular and pigmentation abnormalities in the skin such as rosacea, sun spots, age spots and freckles, as well as poikiloderma, port wine stains, and broken capillaries in the face and leg veins. The Vbeam uses Pulsed Dye Laser (PDL) technology to deliver an intense but gentle burst of light into targeted areas of the skin. There, it is absorbed by the blood vessels or melanin in pigmented areas, safely treating the condition. Treatments typically include two to four sessions of about 20 to 30 minutes each, depending on your skin condition, performed at four-week intervals. Most patients experience a sensation similar to mild sunburn after treatment but can return to normal routines and activities immediately. Results are seen within a few weeks. For additional information, you may visit the Candela website. Sclerotherapy is a medical procedure that has been used since the 1930s to eliminate varicose veins and spider veins. An injection of solution through a very fine needle directly into the vein irritates the lining of the blood vessel, causing it to swell and stick together, and the blood to clot. Over time, the vessel turns into scar tissue that fades from view. For best results, a single blood vessel may have to be injected more than once, some weeks or months apart, depending on its size. Numerous vessels can be injected in any one treatment session. Occasionally, larger varicose veins are connected to the smaller spider veins. In such cases, these vessels should be treated by ultrasound-guided sclerotherapy, stripping, ligation or endovenous laser or radiofrequency treatments. Treating the larger varicosities will increase the success of treating the connecting spider veins with sclerotherapy or leg vein laser. 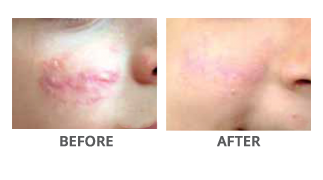 Temporary side effects can include itching, brusing or raised, red areas at the injection site. Larger veins that have been injected may seem lumpy and hard and may take several months to dissolve and fade. Other side effects can include brown lines or spots that appear at the vein site. In most cases, they disappear within three to six months. Neovascularization — the development of new, tiny blood vessels — may occur at the site of sclerotherapy treatment. These tiny veins can appear days or weeks after the procedure, but should fade within three to twelve months without further treatment. After several treatments, most patients can expect an 80 to 90 percent improvement. Fading will gradually occur over months. Disappearance of the treated spider veins is usually achieved, but similar veins may appear in the same general area. Large veins may recur even after surgical procedures. Spider veins may also recur. It may seem that a previously injected vessel has recurred when, in fact, a new spider vein has appeared in the same area. Many patients find that maintenance treatments are required and return for a follow-up treatment once or twice a year. Lasers have been used for more than 20 years. Blood vessels are gradually destroyed by absorption of wavelengths of light by the hemoglobin in blood cells. Many types of lasers, including pulsed dye, long-pulsed, variable-pulsed Nd:YAG and Alexandrite, may be used, as can a non-laser intense pulsed light technique. For additional information about spider vein and varicose vein therapy, visit www.aad.org.